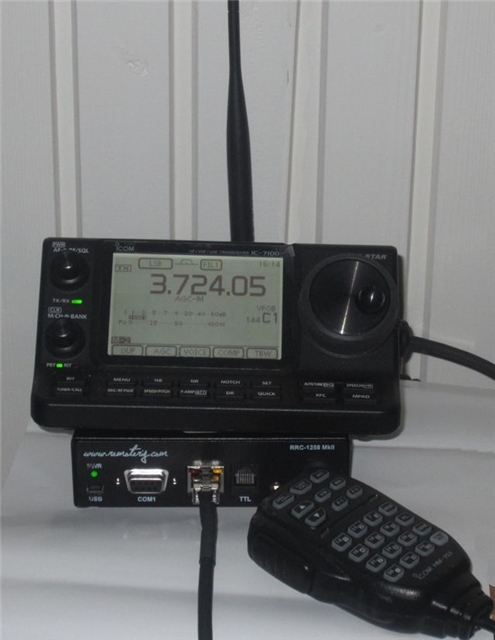 The latest HF/VHF/UHF rig from ICOM are supported by Remoterig. You get full remote functionality from the control panel and the feeling is exactly as if you use them locally. It’s one of the simplest rig to setup and come on the air with. No special cables needed, just connect the RJ45:s and setup the parameters in the boxes. The performance of the radio is comparable with much more expesive earlier models. This setup is going to be a Killer, believe me. ICOM have made a hardware modification lately (March 2014) which makes later produced rigs incompatible with the orginal Remoterig boxes (New IC-7100 control panels are also incompatible with old IC-7100 main units). The reason of the modification was to avoid that data communication will be heard in FM mode at low modulation leves. They have solved it by reducing the amplitude of the data sent from control to main unit. To handle this modification in the Remoterig a interface PCB called 1258M has to be installed in strap socket of the Control-RRC. This board is quite simple and can be built by your self also ( see info here).